Over at the Strange Horizons blog, I've published a call for reviewers, and particularly female reviewers. This is a follow-up to Niall Harrison's recent project to examine how genre review venues break down according to gender. Click through to read more, and if you're interested in writing for Strange Horizons, by all means drop me a line. This week's Strange Horizons reviews kick off with one of the most talked-about books of the last few months, Jo Walton's Among Others, which charms reviewer Michael Levy by being as much about the experience of being a genre fan as a genre story itself. Graham Sleight takes a look at the seemingly puzzling combination of Michael Moorcock and Doctor Who tie-in novels in Doctor Who: The Coming of the Terraphiles, and concludes that the groundbreaking author and the classic-but-revitalized TV series have a lot in common. Today's review is of the anthology Sprawl, edited by Alisa Krasnostein, a collection of fantastic stories by Australian authors from Twelfth Planet Press that deeply impresses its reviewer, Dan Hartland. This week's Strange Horizons reviews kick off with Matthew Jones's take on Caprica, which is a little more negative than mine and, interestingly, more concerned with the technological questions raised by the series's premise, which the show neglected in favor of political and social storylines and, of course, soap opera. On Wednesday, Hannah Strom-Martin reviews the anthology Machine of Death: A Collection of Stories About People Who Know How They Will Die, which I (and I think Hannah too) had taken as nothing but a gimmick, but which she finds surprisingly thoughtful and worthwhile. Today, David McWilliam reviews Charles Stross's latest Laundry novel, The Fuller Memorandum, which he thinks is a welcome return to form after the disappointing Jennifer Morgue. A year ago, when Being Human concluded its second season, I was pretty sure I was done with the show. Being Human's first season was a fun but underbaked affair, clearly too charmed by its own premise--a vampire, Mitchell, a werewolf, George, and a ghost, Annie, who move into a house in Bristol--to do very much with it. The show's second season took that premise and ran with it, and the result was not only a poor piece of storytelling, but morally revolting. Having rid himself at the end of the first season of his genocidal sire-turned-enemy Herrick and thrown in his lot with humanity, Mitchell discovers that his human girlfriend Lucy is in league with the preacher Kemp, who has sent men to kill Mitchell. Mitchell takes out his anger over Lucy's betrayal on all of humanity, waylaying a passenger train and slaughtering the twenty people on board, but the season ends by concluding that Lucy and Kemp are the true villains. "Look at us both, covered in other people's blood," Mitchell tells Lucy in the season finale, "But there's one difference between you and me: you had a choice." This is by no means the only occasion in the finale in which Mitchell permits himself to take the moral high ground with Lucy, whose experiments on werewolves led to the deaths of several people. Even though Mitchell's body count dwarfs hers, she eventually accepts his right to do so. Kemp, meanwhile, is simply a monster, ranting about fire and brimstone as he lusts after Lucy, and proclaiming his righteousness as he kills her, banishes Annie to purgatory, and is dragged bodily into hell. Mitchell, on the other hand, is allowed to return to the bosom of the family he's formed with George and his werewolf girlfriend Nina, who are willing to overlook his past crimes and remain ignorant of his more recent ones, brooding over his misdeeds without taking any steps to atone for them or ensure that they won't recur, and reclaiming his role as a romantic hero by vowing to rescue Annie from the underworld. Being Human's fascination with Mitchell, and its determination to shape itself around him and his stories, was in its first two seasons the show's greatest flaw. The tormented vampire who tries to stop killing is, after all, a rather familiar and even worn trope, and unlike Angel, his obvious template, Mitchell has no mission or life goal to distract either him or us from the monotony of his core dilemma. He spends his time struggling manfully against his desire for human blood, occasionally giving in to that desire, and then beating himself up over his lapse and vowing never to fall off the wagon again (the addiction metaphor is deliberate and made quite explicit over the course of the series, but like True Blood's paralleling of vampires with homosexuals, and especially in light of how Mitchell's story concludes, the analogy is quite problematic). After the third or fourth iteration of this story the audience might be forgiven not only for feeling bored, but for wondering just why such a character--who is either an unrepentant murderer or an irredeemable monster--was still being portrayed as sympathetic and deserving of our affection. I've written before, particularly in my posts about Dexter, about the moral bankruptcy that underlies a lot of the writing for, and audience reception of, antiheroes and reformed villains. Whether we like or dislike a character usually has nothing to do with how moral they are, or whether they do good or evil. We like characters whom we find attractive, and immoral behavior, when cast in the right light, can be very attractive. Power, even if it's just the power to kill, is attractive. The coolness and audacity to declare yourself above the rules of common man, even if those rules are necessary and right, is attractive. In handsome men, tormented brooding over their past misdeeds--so long as it doesn't spill over into an ugly display of uncontrolled emotion--is very attractive. Some storytellers recognize the danger of portraying an antihero in too attractive a manner and try to undercut it, usually with only limited success (Tony Soprano is the best example--no matter how hard the show's writers tried there was always a portion of the audience who thought of him as a hero and just wanted him to bust a cap in his enemies), but as its second season ended, it seemed that Being Human's writers were using every tool at their disposal to maximize Mitchell's attractiveness--pitting him against villains who are not only evil but uncool and decidedly unattractive, showing him in the grips of photogenic remorse, blaming his lapse on a girl. It was easy to imagine Being Human becoming a show dedicated to the woobification of John Mitchell, and to the perpetual justification and whitewashing of his ever more horrific crimes. I wrote off the show in disgust, but curiosity (as well as an appetite whetted by the otherwise lifeless American remake) prompted me to give its third season a try. I'm very glad I did. Not only is Being Human's third season a huge step forward for the show's storytelling, but it does the one thing I never thought the show would have the guts to do. It makes Mitchell unattractive. Not entirely, of course. Aidan Turner is as handsome as ever and does his fair share of emo brooding. But over the course of the season the show exposes and eventually foregrounds the narcissism and hypocrisy that lie beneath Mitchell's facade of coolness and charm. In the season premiere, Mitchell ventures into purgatory to rescue Annie. There he meets Lia, a woman whom only his colossal self-absorption and century-honed capacity for denial allow him to fail to recognize as one of his victims from the train car. During a brief tour of some of his past murders, Mitchell makes the by-now familiar excuses for his crimes--he can't help himself, he is also a victim, it was all the other vampires' fault--but when Lia reveals herself he finally admits that he is a monster who has enjoyed slaughtering his way across a century. In itself, this is not a meaningful change in the show's depiction of Mitchell. Admitting his monstrousness and expressing self-loathing was part of his cycle of relapse and remorse in the show's first two seasons and probably for decades beforehand. The show has always found a way to suggest that there is a loophole to his incurable desire to feed and that this time around Mitchell would find it. But Lia is as uninterested as we are in yet another round of this game, and sets up the season's overarching plot when she tells Mitchell that he is going to be killed by a werewolf. With those few words, she explodes Mitchell's pretense of penitence. The minute he hears that he is about to get the punishment that he claims to crave, Mitchell begins scheming to find ways to avoid it. As the season draws on, Mitchell's aura of coolness is replaced by the stench of desperation, and the acts he becomes willing to commit in order to save himself grow more and more off-putting. When George and Nina befriend McNair and Tom, father and son werewolves, Mitchell fixates on the older man, who has a chip on his shoulder about vampires, as his potential killer, and sells him to local vampires as the star attraction in a lethal circus act. When Herrick, brought back to life at the end of the second season, shows up on the family's doorstep with no memory of who or what he is, Mitchell becomes obsessed with learning the secret of his resurrection, to which end he tortures Herrick, and very nearly feeds him an innocent woman. "I think there's a poison in you which has nothing to do with being a vampire," Nina tells Mitchell halfway through the season, and the third season, in which Mitchell does not drink a single drop of blood but nevertheless does so much damage, seems dedicated to exposing that poison, the core of emptiness in Mitchell's heart. Like Dexter, Mitchell is a sociopath whose few meaningful relationships mask a fundamental inability to grasp that other people are real, but unlike Dexter, he isn't content to think of himself as a monster. Throughout the season we see Mitchell make up stories, narratives of his life in which he is the tragic, and ultimately blameless, hero. But, like the stories that Mitchell spins for George and Annie when they start asking questions about the train murder, or for the police when they do the same, these narratives keep changing to serve his interests, which ultimately exposes their hollowness. Mitchell tells Lia that he wants to be punished, and at the beginning of the season he delights in declaring to other vampires the worthlessness of their race. But when he and Annie become romantically involved, the narrative changes. Now Mitchell must spare Annie the heartbreak of knowing what he's done, and his efforts to stay alive are consecrated by her goodness and the purity of their love. When Annie begins to investigate the train murders and urges Mitchell to help the police catch the vampires responsible, he tells her that to reveal the existence of the supernatural to humanity would spark an all-out war that humans are bound to lose. Staying out of prison thus becomes an act of heroism. But when Mitchell is arrested, he begs Annie to break him out by claiming that he's the underdog--the terrified, uncomprehending humans are bound to kill him. When Lia asks Mitchell why he didn't kill himself upon becoming a vampire, he tells her that he wasn't going to let "it"--the vampire--win, and it's obvious that he thinks himself brave for this choice. A few episodes later, trying to persuade Herrick to feed, Mitchell paints giving into hunger as the brave act. By the time Mitchell, at the end of the season, comes to understand himself fully and asks George to kill him, thus ending the cycle of death, we as well as the characters have heard so many of his stories that we can recognize this request--earnest and genuinely remorseful as it clearly is--as yet another of Mitchell's attempts to cast himself as the tragic hero of an angsty story. His heroic death is therefore tinged with the same narcissism that had guided his life. Despite the heavy debt that it owes to the Buffyverse, one of Being Human's most interesting, but also most frustrating, traits in its first two seasons was its rejection of that universe's stake-and-crossbows ethos. Everyone on the show, and Mitchell in particular, balked at dealing the death penalty to even the worst and most murderous vampire. The implication was obvious--vampires and werewolves are still people, and killing a person is murder. The third season reinforces this message. In the episode "Adam's Family," George and Nina become the unwilling guardians of a teenage vampire who has slowly drunk his parents to death, and try to fob him off on a local vampire couple only to discover that these new guardians are racist, classist fetish freaks whose debauched lifestyle terrifies their new ward; in "The Longest Day" (an excellent, meaty episode that is one of the season's, and the series's, highlights), Nina insists and finally persuades George that to kill the helpless, amnesiac Herrick would be murder; in the season's penultimate episode, Annie stakes a vampire in order to stop him from killing a woman, and calls herself a murderer for it; and in the season finale, George, Annie, and Nina, even knowing the things that he's done and how inevitable his relapse is, take a long time to talk themselves into killing Mitchell. There's something very admirable about this approach, especially when one considers the conventions of the vampire story in most other venues. It's too easy to categorize certain people as "other" and therefore not as deserving of life, or of the same protection of the law and due process, as the rest of us, and Being Human challenges us to remember that whenever it rejects the easy solution offered by the stake. But there's also a one-sidedness to it that left a huge moral gap in Being Human's first two seasons. It's all very well and good to say that all life, even vampire life, is sacred, but what do you do with someone who refuses to recognize that sanctity? Morality in Being Human is on the level of the individual, not of society (which doesn't seem to exist for werewolves or ghosts, and is entirely immoral in the case of vampires). There is no law or due process that applies--or is allowed to apply--to vampires, and this translates into a carte blanche for vampires to wander the earth for centuries, killing left and right, without anyone having the moral authority to take their lives. The third season addresses this imbalance, first through Mitchell losing his compunctions about killing vampires, then through his killing of Herrick, and finally through his recognition that his return to the bloodsucking fold is inevitable and his death at George's hands. It's not quite justice--victims like McNair and Lia still find themselves having to choose between letting their abusers go free or becoming monsters themselves in the pursuit of revenge--but it is an acknowledgment that in the system the show has created, killing isn't always an indication of a lack of respect for life. In fact, I find myself wondering if the pendulum hasn't swung a little too far. The fact that Mitchell is actually killed at the end of the third season is, if not exactly gratifying, then at least the only honest, satisfying, moral ending to his story. I'm shocked and deeply impressed by the writers' willingness to take that step, which I had been certain, all the way to the last swing of the stake, that the show would chicken out of. (The cynic in me, however, wonders whether this story would have been written if Turner weren't attached to the Hobbit production for at least the next year, and probably hoping for bigger and better things out of that role.) But Mitchell's end also means that the take-away from his story is that being human was, ultimately, something he couldn't do. And as Mitchell was one of only a few pro-human vampires featured on the show, and just about every other vampire who has tried, like him, to stop feeding has eventually fallen off the wagon (the possible exception is Adam, who, if he hasn't already lapsed, has only been dry for a few months at the end of the third season), it seems reasonable to conclude that this inability extends to the entire race, and that therefore the right, moral response to a vampire is to stake them. (The show could, of course, replace Mitchell with another sympathetic vampire, but then the writers would find themselves in exactly the same bind they were in with Mitchell.) The season ends with George, Annie and Nina realizing just how high up vampire infiltration of human institutions goes, and with a new head vampire introducing himself to the group and promising to make their life hell, to which George responds, "you've got a fight on your hands." The implication is that Mitchell-less Being Human will be about the fight to defeat or maybe even rid the world of vampires, and as frustrating as I found Being Human's localized pacifism in its first two seasons, I'm not sure that switching to a vampire slaying story will be an improvement. Being Human's third season is not perfect--George and Annie are still being written somewhat inconsistently, as is the romance between Annie and Mitchell, which in the season's last minutes is retconned from an ill-advised and painfully awkward relationship to the great love of both their lives; the season finale is oddly structured, and the whole season, but especially its latter half, is very talky. Nevertheless, the season sees the show finally finding the story it was meant to tell, and once that happens Being Human's storytelling improves dramatically--for all its flaws, the season is tense and hugely entertaining. The only question is, what's next? Can Being Human reshape itself without the character that acted as its core for three seasons, and with an entirely different story to tell? If the third season teaches us anything, it's that given enough time and the proper inducements, Being Human's writers can meet the toughest challenge, but does this mean it'll take them another two lackluster, frustrating seasons to figure out how to take the show to the next level, and will they even be given that chance (Turner was a huge part of the show's draw and it's not difficult to imagine a large part of its fandom tuning out now that he's gone)? Whether or not Being Human manages to survive the shake-up at its end, the third season is worth applauding and celebrating in its own right. I'm very glad that I didn't break with the show last year, and got to watch it. The results of the Strange Horizons 2010 readers' poll are in, and, alongside such winners as Theodora Goss (best short story), Marge Simon (best poem), and Orrin Grey (best article), I'm stunned to announce that I was voted best reviewer. I'm joined in that category by Adam Roberts, Niall Harrison, Matthew Cheney, and Farah Mendlesohn, which is such an august group of reviewers that I can't believe anyone would rank me above them. Thanks a lot to everyone who voted, and congratulations to the other winners. Genevieve Valentine joins Strange Horizons as a columnist this week, and her first column is about reading the film Winter's Bone as a fairy tale. I saw Winter's Bone just last week, and at the Strange Horizons blog I discuss Genevieve's column and some of my reactions to the film. Actually, the absence of a thing: I've let my series about the Strange Horizons review policy lapse for, quite frankly, lack of time. I'm hopeful that I'll be able to revive it before the end of the month. This week's Strange Horizons reviews kick off with Richard Larson's discussion of one of the most talked-about science fiction novels of the last year, Charles Yu's How to Live Safely in a Science Fictional Universe, with Richard joining in the novel's near-unanimous praise. On Wednesday, Andy Sawyer puzzles over Ken MacLeod's The Restoration Game, and the meaning of its twist ending. Today's review, by Duncan Lawie, is of a debut that we might have called urban fantasy a few years ago when that term had a very different meaning, Ben Aaronovitch's Rivers of London (Midnight Riot in the US). Some of the books I never got around to writing about in the women writing SF project, and a few of the ones I've read since then. 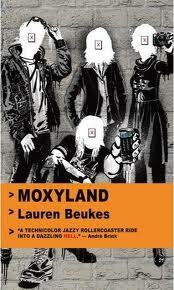 Moxyland by Lauren Beukes - I found a lot to be impressed by in Moxyland, one of the most talked-about debuts of the last few years. What I didn't find was a novel. The book feels like a demonstration of Beukes's talent--for worldbuilding, for constructing interesting and flawed characters, for bravely taking her story to its dispiriting conclusion--but its pieces don't come together into a greater whole. Which is not to say that Moxyland isn't worth reading. The setting--a future South Africa in which corporations and government have become indistinguishable--is a nice blend of cyberpunk tropes, real-world problems taken to the nth degree, and the strangeness of a foreign country with a troubled history. A lot of the devices Beukes deploys are familiar--cell-phones are necessary for everything from buying food to using public transport, so the police uses the threat of temporary or permanent disconnection to keep troublesome citizens and anti-establishment protesters in line, and breaks up demonstrations by using them to deliver electric shocks; advertising is ubiquitous and, in many cases, illegal to block; employment contracts more closely resemble indentured servitude, and seeking alternate employment is very nearly a criminal offense--but she uses them with aplomb and makes them her own. Moxyland describes the intersecting lives of four characters--a naive artist who has sold her body as a billboard to a drinks manufacturer; a narcissistic, bed-hopping, shock-jock blogger; an activist being drawn towards increasingly dangerous but no less futile acts of protest; and a corporate employee ruthlessly trying to maneuver her way into a better job. These are unpleasant people in unpleasant situations whose stories end unpleasantly, and Beukes isn't afraid to take any of them to the depressing places her premise demands. At the same time, she doesn't let gloom overwhelm the novel, which for all its hopelessness is an energetic, engaging read. There is, in short, a lot to be impressed by here, but despite the faint intimation of change at the novel's end (which gives the impression that it is a prologue to a very different story), Moxyland feels more like a snapshot than a story, more like a promise that Beukes can do great things than that promise's fruition. I'm certainly planning to seek out more of Beukes's fiction, though--most obviously, her second novel Zoo City, recently nominated for the Clarke--in the certainty that she can achieve that greatness. 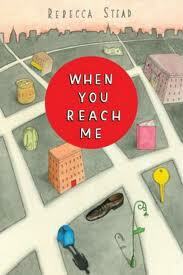 When You Reach Me by Rebecca Stead - I first heard about Stead's Newbery-winning children's novel when it participated in School Library Journal's Tournament of Kids' Books last year, where its description as an homage to both A Wrinkle in Time and Harriet the Spy intrigued me. Though the book skews a bit younger than most of the YA fiction I tend to read, it tells a resonant story--growing up in New York in the early 70s, narrator Miranda is distracted from humdrum problems such a single mother who is frustrated by her job and afraid to commit to her boyfriend, a best friend who has stopped talking to her, and a snooty rich girl at school, by notes that seem to predict the future and ask her to carry out certain tasks in order to prevent an unspecified calamity. Miranda is well-drawn as someone who is both intelligent and believably limited, and part of the pleasure of the novel is watching her realize how many of she assumptions she makes at the beginning of the book were mistaken--the break with her best friend turns to have been the right choice for both of them, the girl she hates turns out to be smart and cool. The time travel aspect of the story, however, is less successful. It relies on Miranda being so unfamiliar with the tropes of the time travel story that she can barely wrap her mind around them. That may be believable for a child growing up in the 70s, but surely nowadays even children are so familiar with time travel as a story element that they can understand, for example, how you can arrive at a place before you left it. For an adult reader, Miranda's slowness in figuring out what's happening to her, while not an insurmountable obstacle to enjoying When You Reach Me, makes the book a lot harder to get lost in. 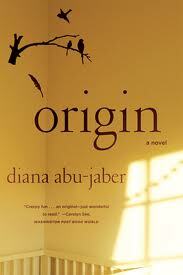 Origin by Diana Abu-Jaber - I chose this book for the women writing SF project not so much because Origin is science fiction (though as a mystery it is a genre novel, and it raises the possibility of being SFnal very briefly) but because I thought it might be interesting to add to that project a mimetic novel about a female scientist--the narrator, Lena, is a fingerprint analyst in Syracuse who is called upon to help investigate a series of suspicious crib deaths. What I found instead was a novel that put me very strongly in mind of Kit Whitfield's Benighted, which, if you've read my review of that novel, you'll know is no great praise. Like Benighted's Lola May, Origin's Lena is a neurotic who, at thirty, has barely any grasp of how to function in society or how to deal with people on any but the most basic level. There's an interesting story to be told here, obviously--Lena might suffer from serious mental health problems, or the novel could point out the responsibility she bears for cutting herself off from human interaction (or both)--but like Whitfield, Abu-Jaber chooses to portray Lena as a hard-done-by victim, whose social phobias are solely the fault of wicked people around her--unloving parents, conniving colleagues, a domineering ex-husband--and easily remedied by a love interest who seemingly has no other goal in life but to pursue Lena in a respectful but relentless manner, break down the walls of her social maladroitness, and dedicate his every moment to her happiness. Even the science part of the novel turned out to be a dud--Lena is a sought-after crime lab technician despite having no formal education not because she's a good scientist, but because she has insights into crime scenes that not even she can fully explain, and the novel is a lot more interested in her emo narrative than in science and rational enquiry. The mystery itself, despite the irresistible hook of a serial killer who targets infants, fails to ignite--at one point Abu-Jaber has to posit that the victims' families somehow convince the press that their children's death are an act of terrorism in order to keep the tension from flagging--and its conclusion arrived long past the point where I had ceased to care about it. I Shall Wear Midnight by Terry Pratchett - Fans of Pratchett's writing have long ago learned to ignore the author's occasional proclamation that the next book would be his last, or the last in the Discworld series, or the last to feature a certain character or setting. Somehow, once the manuscript was turned in, there always turned out to be another story in the tank. Nevertheless, there is a feeling of finality about I Shall Wear Midnight, and not just to the YA-oriented Tiffany Aching series, of which it is the fourth volume, but to the whole world of the witches of Lancre and the surrounding regions. For one thing, Tiffany is no longer a young adult. Though she's only 16 at I Shall Wear Midnight's outset, there is nothing childish or juvenile about her. She's been carrying a woman's load for quite some time, caring for the sick and elderly, resolving disputes, and acting as an official arbiter and figure of authority in her native Chalk. I Shall Wear Midnight sees Tiffany coming into her own as the head witch of the Chalk, to which end she must earn the respect and acceptance of the new Baron Roland, her former friend and almost-paramour (Pratchett handles this near-miss with delicacy, remaining true to both characters but also making a persuasive argument for their incompatibility; it is frankly refreshing to see, in YA fiction, childhood sweethearts who realize, upon reaching adulthood, that they really shouldn't be together). Throwing a wrench in those plans is the spirit of a dead witchhunter who awakens anti-witch sentiment in Roland and the people of the Chalk. Which is how I Shall Wear Midnight manages to cap off the whole sequence of witch-centric Discworld novels--it is a story about the nature of witchcraft and its necessity, and its climax brings to Tiffany's side not only familiar figures such as Granny Weatherwax and Nanny Ogg, and new ones such as the young witches she discovers and trains on the Chalk, but reaches all the way back to Equal Rites, the very first witch novel, to let us know what became of its heroine. The problem here, and not for the first time, is that these are very familiar beats. 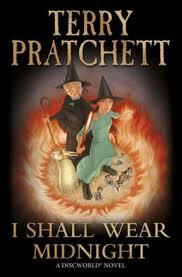 I Shall Wear Midnight wants to be a crescendo, the definitive statement of Pratchett's take on the role of witches in his world--as quasi-magical social workers, simultaneously leaders and servants of their community--and on the evils of human nature that make them necessary. But instead of a crescendo the novel is a repetition of what most of the previous witch novels have said already. The first Tiffany Aching novel, The Wee Free Men, was one of the freshest, most engaging Discworld novels of the last decade, giving us a new and entirely different perspective on the nature of witchcraft and its practitioners while telling an exciting and funny story. But perhaps because it rested on a foundation already six books deep, the series very quickly descended into familiarity, and into the same tendency to prioritize message over plot that has marred most of Pratchett's writing in the last half-decade. I Shall Wear Midnight also confirms what the previous volume in the Tiffany series, Wintersmith, had suggested--that though Tiffany herself is a wonderful character, her series's premise has a lot less give in it, and a lot less room for expansion and for new kinds of stories, than the regular witch novels. Tiffany's pixie protectors the Nac Mac Feegle, for example, have gone from a hilarious invention in The Wee Free Men to a tired joke, and their role in the novel feels forced. I Shall Wear Midnight is by no means a slog, but it rather persuasively argues that even if Pratchett doesn't intend it as the last witch novel, it probably should be. 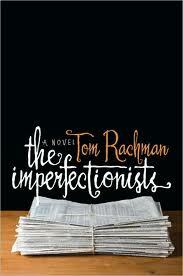 The Imperfectionists by Tom Rachman - It's a piece of rather bad luck that after two months of reading thought-provoking, evocative, beautifully-written genre novels, my first foray back into literary fiction should be Rachman's snide, unfunny, inexplicably well-received novel. I find myself wanting to rant, like the most partisan of genre enthusiasts, about the worthlessness of a critical scene that elevates novels like this one. Set in and around the offices of a Rome-based international paper during the second half of the last decade, The Imperfectionists charts the death throes of the paper--and of the print journalism industry--by visiting the people who make it work, from the managing editor to stringers in Cairo and Paris to the chief financial officer to the paper's most loyal reader, dedicating a chapter to each and weaving through them the paper's history and the steps that lead to its demise. The problem is that none of these people are characters--they're caricatures, whose behavior is, at best, trite and predictable (the Paris correspondent is so desperate for a byline that he sells out his estranged son by naming him as a source; the corrections editor has spent a lifetime romanticizing a childhood friend as a free-spirited artist, but discovers when they meet again that his is the adventurous, cosmopolitan life while his friend has happily settled into bourgeois mediocrity). At worst, they are simply unrecognizable as human beings. Rachman seems to be aiming for humor, but he more often hits something so broad and obvious that it turns leaden. In one chapter, a grad school dropout is angling for a job as a stringer in Cairo, but is so completely lacking in backbone or any sense of how the world works that he not only allows himself to be scooped by his opponent, a walking stereotype of the man's man, globetrotting, war-zone reporter, but ends up giving the guy a place to stay, paying for his cabs and meals, and letting him carry off his laptop and house keys. Possibly the worst chapter in the novel involves the paper's chief financial officer, who finds herself seated on a plane next to an employee she's just fired. As the two struck up a flirtation, magically discovering how much they had in common, I said to myself that not even Rachman could possibly be aiming at a conclusion as juvenile and preposterous as the revelation that the fired employee is playing a cruel prank of seduction and revenge, but this is exactly how the chapter ended. There are one or two readable chapters--the best, which sadly comes rather early in the novel, tells the story of the paper's obituary editor, who has let his career fester in order to spend time with his daughter only for her to die in an accident; it is probably telling, however, that Rachman must reach for a dead child before he can elicit genuine emotion--but for the most part The Imperfectionists is a clomping, cliché-ridden novel. I can't help but wonder whether the ecstatic reviews I've seen for the book--which have almost uniformly called it nuanced, well-observed, and, most incredibly, funny--aren't tinged by their authors' being print journalists themselves, and perhaps too caught up in the excitement of seeing their own profession captured in fiction, and elegiac fiction to boot, to notice how little humanity there is in the novel. Whether or not I'm right, neither The Imperfectionists nor its critical reception leave me feeling particularly heartbroken about the death of print journalism. 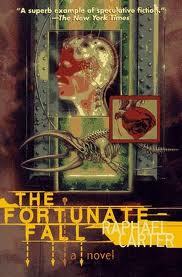 The Fortunate Fall by Raphael Carter - This is three quarters of a truly excellent novel, sadly undone by its last fifty pages. To put it another way, The Fortunate Fall works really well as a piece of worldbuilding, but falls flat on its face trying to tell a story in that world. The world, however, is very nearly worth the price of admission, combining cyberpunk and transhumanism with third world and post-genocide politics into a setting that I would have loved to have spent more time in--albeit with another author. Maya is a journalist several centuries in the future, in a Russia only a few decades past a brutal, genocidal conquest (by Americans, though the novel makes very little of this--we don't find out anything about the American "Guardians," their philosophy, or the reasons for the slaughter they carried out, and in the novel's present the US is mentioned only briefly as a wasteland that none of the characters are particularly concerned with) which was only overcome through the force of another atrocity--a computer virus that turned millions of the Guardians' subjects into the single-minded, relentless Unanimous Army. In the present, the same brain-chip technology that allowed the Army to come into existence, now heavily regulated, is used for entertainment. Maya doesn't report the news but allows her viewers to experience it through her networked sensorium. In the post-Guardian world, the new superpower is Africa, which largely escaped the Guardians' and the Army's ravages, where mind-sharing technology is used freely and the definition of human is rapidly evolving. In the former subjugated nations, remnants of tyrannical rule are still in place, and Maya in particular is fearful of being arrested for her sexual orientation. There is, obviously, a hell of a lot that could be done in this setting, and though it is understandable, given its intricacy, that Carter spends most of the novel simply explaining its world to us, once that setting is established the story he chooses to tell in it is a let-down. Maya is investigating the little-documented Guardian period and the Unanimous Army, and stumbles upon a former dissident and present-day enemy of the state who promises her the story of a lifetime. "Stumbles," is, in fact, exactly the right word--Maya does little investigative work on her own and the story seems largely to fall in her lap. That this turns out to be deliberate, a plan by Maya's source and her new screener--the person who edits Maya's thoughts and emotional state for public consumption, and also doubles as her research assistant--doesn't truly justify how shapeless and cobbled-together the novel's plot, and Maya's progress along it, feel--though again, for most of the novel, when Carter's energies are directed towards having Maya explain her world's culture, politics, and history to us, this is not a problem. When the long-awaited interview with the mysterious source finally occurs, however, it turns out to be a chance for him and for Maya's screener to speechify for 50 pages, elaborating on the subjects that underpin the novel--the changing nature of personhood in the wake of mind-sharing technology, the effect that that technology has on human capacity for empathy, and the morality of doing evil for the sake of achieving good. Important and interesting topics all, but not when they're delivered as a lecture that more than anything else put me in mind of the Architect scene in The Matrix Reloaded. The tragic love story in Maya's past, which is supposed to humanize these chapters, is too thinly sketched--too drowned out by worldbuilding--so that when Maya finally finds herself forced to choose between accepting her lover as an altered, possibly evil transhuman, and living alone, we know so little about either character that it's hard to know which outcome to root for. Despite its tedious conclusion, The Fortunate Fall is worth a look for its setting and the ideas that have gone into it, but it is ultimately a failure. This week on Strange Horizons, Nader Elhefnawy rounds off February with his review of L.E. Modesitt Jr.'s Empress of Eternity, which Nader thinks has its strong points, but is ultimately a disappointing execution of an interesting premise. Dan Hartland kicks off March on a more positive note, with a glowing review of Zoran Živković's short novel The Ghostwriter. Continuing the trend, C.B. Harvey is also quite pleased with Col Buchanan's debut fantasy, Farlander. John Clute is less cheerful in the latest installment of his column Scores, in which he is decidedly unimpressed by three recent novellas, Tobias Buckell's The Executioness, Paolo Bacigalupi's The Alchemist, and Elizabeth Bear's The White City.